Kite boarders in the bay at St. Petersburg, Florida. It was a windy spring day and about thirty kite boarders were skimming the water of the bay. With the bridge in the background, it made a very colorful scene. View in the largest sizes to see the detail. Thanks for all the nice comments about Willoughby. He is a very sweet dog and we love him. Spring finally seems to be springing in Colorado Springs and we are ready for it! I'm looking forward to seeing what you talented smugmuggers put up today! Looking at your photos gives me a lot of pleasure each day and invariably inspires me to try new things. Thanks to all of you for being my inspiration! 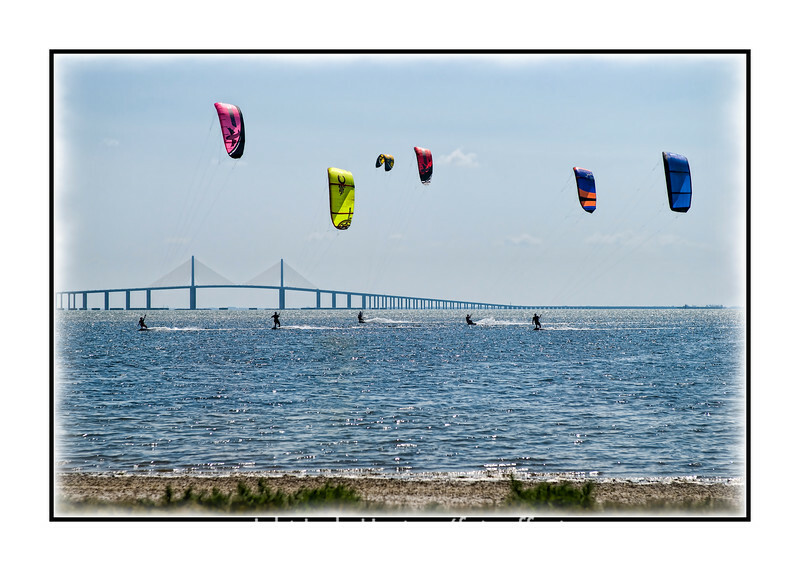 This would be a great picture without the kite boarders, but I certainly like their extra splash of color too. Fantastic shot...the bridge provides a great background to the already neat shot. This is an outstanding gallery. You have some amazing shots here and I just wanted to say great work and keep it up. What a find, what a capture! Marvellous on fullscreen!